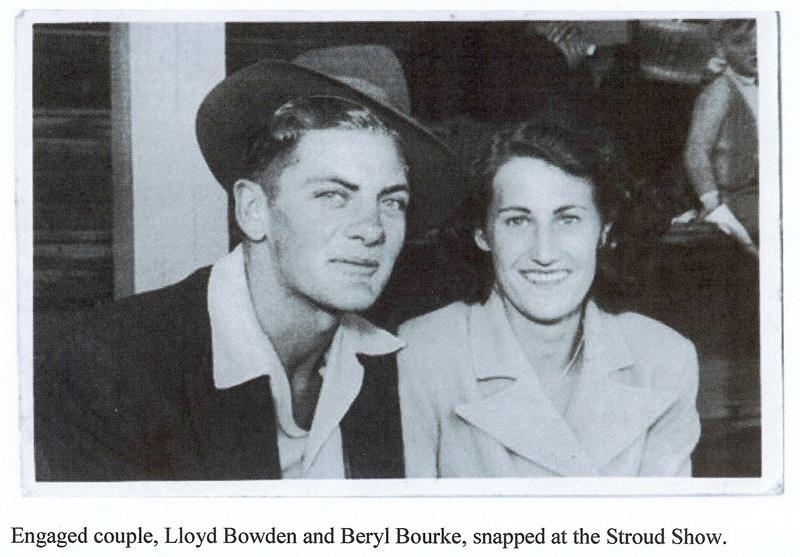 The annual Stroud Show was an important event in our young lives. Once we heard the voice from the public address system come over the mike we would torment mum to let us go. She would line us up and go through her checklist.” Do you have a cardigan, a hankie; have you been to the toilet? Had a drink of water? Are your nails and shoes clean?” Satisfied that we were presentable, she then handed us three threepences (9cents) each. “Now don’t go to your father for more.” she said. She knew as we did that Dad was an easy mark. Off we went feeling very smart in our new clothes. Mum had been sewing and knitting for months to dress us for the Show. As the youngest of five girls this was the only time that I had a new dress – I usually inherited dresses from my sisters. It nearly always rained for Stroud Show so an unfortunate but necessary addition to our outfit was, very often, rubber boots. Arriving at the ground I would head for the pavilion to view the displays of cooking, flowers and fine arts. I was really interested to know who got the prize for best sponge cake, the champion rose, best-embroidered supper-cloth or biggest pumpkin. Very often the same people won each year but occasionally a ‘new chum’ waltzed off with some of the prizes and caused an upset. After all, a certain amount of prestige was involved in winning the blue ribbons! Next I checked out the sideshows but didn’t go in. My precious nine pence was not to be spent on The Tattooed Lady or Dinnie the Biggest Pig in the World. What I really wanted was a ride on the Merry-Go-Round and a bag of fairy floss. Everything was threepence a go…so nine -pence didn’t last long. When my money was gone I’d go looking for Dad. He wasn’t hard to find. He enjoyed watching the horses performing so I knew he would be seated round the ring. “How are you Bub?” he’d ask as I sat down beside him “Any money left?” When I admitted I was broke he would find a threepence or sixpence. Then off I would go and have another ride on the Merry- go-Round or another bag of fairy floss. At 2 o’clock in the afternoon a great hullabaloo directed our attention to the Boxing tent, where on a platform out the front, a couple of boxers in laddered tights banged big bass drums, while a man with a megaphone shouted “Roll up Roll up”. When he felt he had the crowd’s attention he introduced his star boxers. One by one they would appear from inside the tent and stand beside him in their satin shorts and dressing gowns, while he listed their boxing triumphs and invited any local lad to win ten pounds by going five rounds with one of their own choosing. There were always some locals who, after visiting the bar, fancied they could box a bit and so the challenge was accepted. When the spruiker was satisfied he had enough contenders, the show then got under way. I don’t know who won…I never went in to see! I was fond of watching the horse events, and it was free! I’d sit with Dad and watch the ‘camp drafts’ and the ‘hunts’. 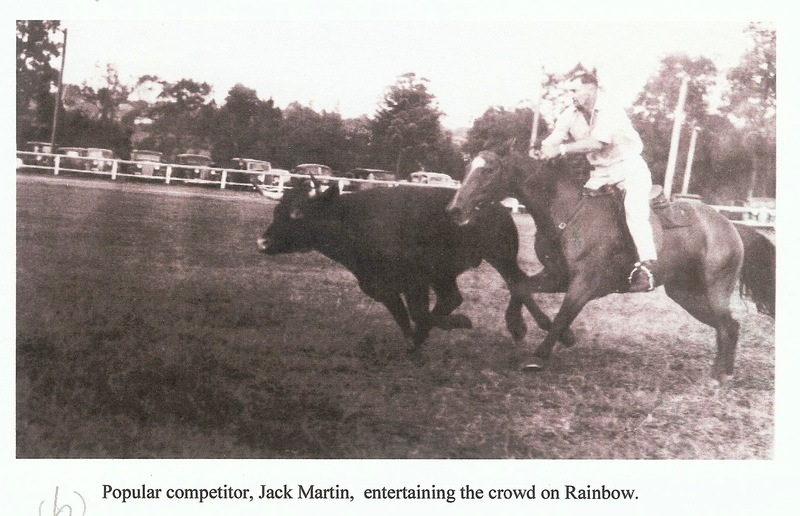 Cyril ‘Squib’ Marsh on ‘Soldier Boy’ and Jackie Martin on ‘Rainbow’ hotly contested the flag and bending races. The programme always ended with the high jump. Even though my heart was in my mouth all the time, I never missed watching this event. I sat and watched until the horse left the ground then would shut my eyes and open them when Dad assured me that horse and rider had landed safely. The Show Ball was held on Friday night. Some of the riders who competed in the horse events came along. I had a dance with one of the riders who was still wearing his spurs. When they became entangled in my net evening dress I was not pleased!! The final wind-up was a dance on Saturday night. It was then all over for another year. When the first Brickthrowing was held in 1960, it was thought that it would be the end of the Stroud Show. Things were a bit shaky for a time but eventually the Show reasserted itself and is now as popular as ever. It has been found that there is room on the Stroud events calendar for both to operate successfully. A charming and unexpected compliment to our daughter Anne was an invitation to open the 2008 Stroud Show. She had had recent success with her double bill of plays presented at the Civic playhouse, Grace and Lost Property, both set in Stroud and was receiving substantial media attention. Perhaps her public profile may have prompted the committee’s decision to issue the invitation. Her first reaction was that ‘she wasn’t important enough’, but gratefully accepted anyway. Like all young people growing up in Stroud the annual show created many happy memories for her. As a teenager the preparations began months before as ‘what to wear’ was very important indeed. One year when she was going through her ‘hippie’ faze I asked Rosemary Neville if she’d seen Anne and she answered ‘No but I saw Pocahontas up by the Octopus.’ When I found her I thought to myself that Rosemary’s description had been spot on. There she was decked out in her flared pants, cork platform shoes, cheesecloth top– accessorised with pumpkin seed beads and a plaited leather headband! Wonderful story as usual Beryl…. waiting in anticipation for the next one. Hi Mum…great story that evoked my childhood ‘show memories’ too. The Show was always ‘the’ day of the year for us kids and one that I recall with many a fond memory. In my early days at the show (in the mid sixties) the Dodgem Cars and Shooting Gallery was where my hard saved $4 or $5 would mostly be spent. The fast ‘up and down’ type of rides like The Big Whizzer and The Octopus didn’t (and still don’t) appeal to my weak stomach! At the Shooting Gallery it didn’t matter how good a shot you were as the air rifles never ever shot straight (on purpose I’m sure), so winning a prize was highly unlikely…didn’t stop us from trying though. I remember a couple of us kids snuck under the flap into the boxing tent once…Fred Brophy’s Boxing Troupe I think it was called (which is probably the same one you refer to as by the 60’s I recall Fred was quite an old man). The weak looking boxer Fred paraded out the front (that everyone wanted to fight) mysteriously became injured so the locals had to take on much more seasoned opponents once inside…most came off decidedly second best!